When the Equal Rights Amendment was first passed by Congress in 1972, Richard Nixon was president and All in the Family’s Archie Bunker was telling his feisty wife Edith to stifle it. Over the course of the next ten years, an initial wave of enthusiasm led to ratification of the ERA by thirty-five states, just three short of the thirty-eight states needed by the 1982 deadline. 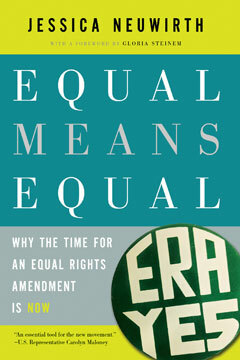 Many of the arguments against the ERA that historically stood in the way of ratification have gone the way of bouffant hairdos and Bobby Riggs, and a new Coalition for the ERA was recently set up to bring the experience and wisdom of old-guard activists together with the energy and social media skills of a new-guard generation of women. recognized by the U.S. Supreme Court, Equal Means Equal tells the story of the legal cases that inform the need for an ERA, along with contemporary cases in which women’s rights are compromised without the protection of an ERA. Covering topics ranging from pay equity and pregnancy discrimination to violence against women, the book makes abundantly clear that an ERA will improve the lives of real women living in America.